Oregon Rediviva | A Sly Sty Stealer? This is a rather unnerving postcard. It was mailed from Marshfield (now Coos Bay), Oregon, on December 24, 1905, to Miss Annie Edie in Tillamook, Oregon. There is no message, and it is unsigned. Annie Edie may be the sister of Charlotte, who married B. C. Lamb, a prominent Tillamook businessman; there is a collection of family papers at the Oregon Historical Society research library. The postcard publisher, D. M. Averill, according to research by Tom Robinson of Historic Photo Archive, was a dealer in cameras and photographic supplies and a photofinisher who broadened into postcard publication. He disappeared from Portland view in 1909. 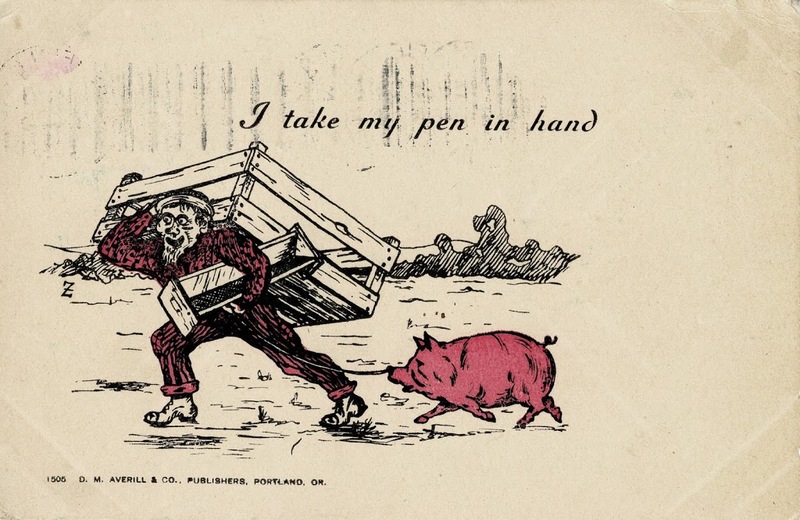 One hopes that Annie had reason to be faintly amused, rather than repulsed, at receiving a card depicting a maniacal swineherd towing his pig while toting its sty. And despite the pledge to write, the sender did not write a thing!